Carmel Valley area is a beautiful place to live, work, and play with average temperatures in the 70s. Yet the sunshine, arid climate, and winds pose a challenge to eye and skin health. 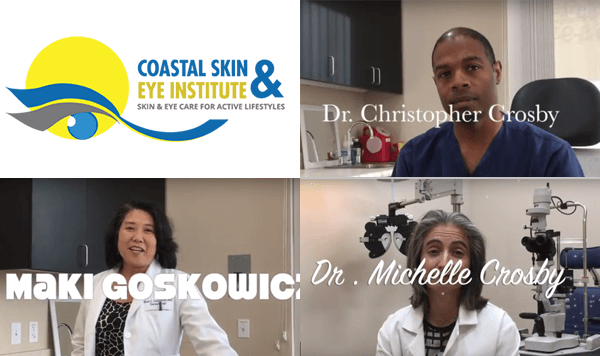 The highly-qualified team at Coastal Skin & Eye Institute are eager to help. With a Board-certified dermatologist, Board-certified ophthalmologist, and licensed optician on staff, it has become the skin and eye care center that families in coastal San Diego, CA trust for one-stop care. To help you see as good as you look, schedule a vision check and select from a broad range of eyeglass frame and lens choices. Protect your eyes from harmful UV rays with high-quality sunglasses (prescription and non-prescription). Coastal Skin & Eye Institute is located in The Merge shopping center at Corum Court. You can count on a warm greeting and assistance with all your skin and vision needs. Office hours are 9:00 a.m. to 5:00 p.m. weekdays. Call (858) 943-2540 or visit www.coastalskineye.com to book an appointment. How you see is vital to quality of life. How you look is important to emotional wellbeing. 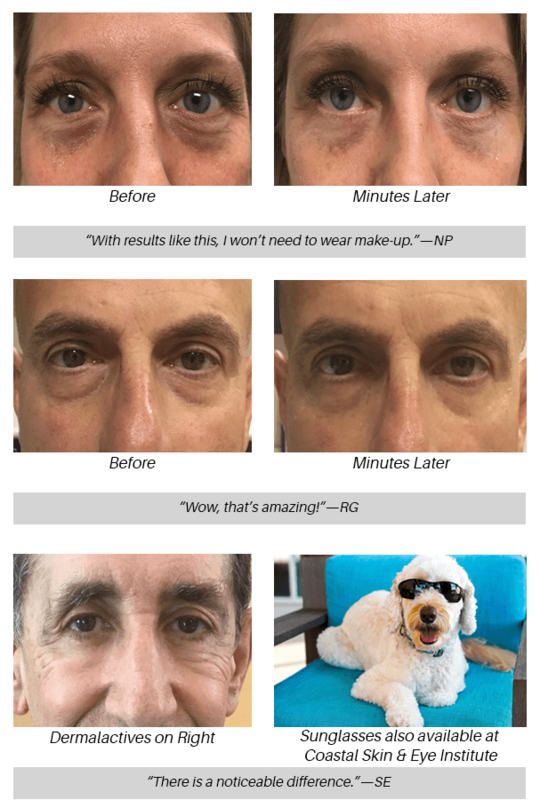 The professionals at Coastal Skin & Eye Institute in San Diego understand. They work together to keep you looking and seeing well. This multi-faceted practice is pleased to offer the rejuvenating benefits of Dermalactives skin care. 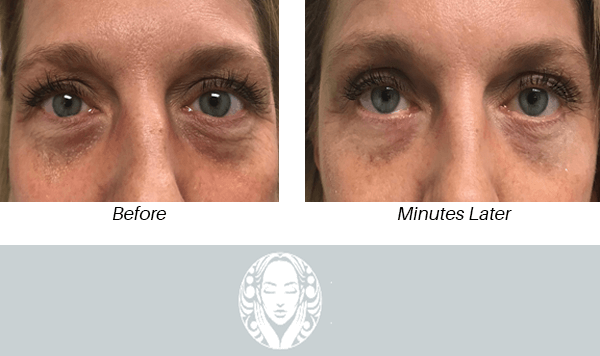 Wrinkles are invisible to the human eye! Rather, we see shadows and contrasts cast by these imperfections in skin texture. Once, the only solutions for a smoother complexion were facelift surgery or dermal filler injections. Yet, a similar illusion can be created without surgery or needles. It is the Dermalactives Advanced Non Surgical Collagen Solution. This formulation fills lines with light-diffusing minerals. It reflects light from creases, making shadows from wrinkles optically disappear. Improvement is immediate. Just stroke the serum onto clean skin and allow it to dry for a few minutes – no needles, cutting, sutures, or scars required. Benefits of treatment are lasting, as well. The preparation contains essential peptides and other medical-grade ingredients that improve the condition of skin, reducing future occurrence of wrinkles. 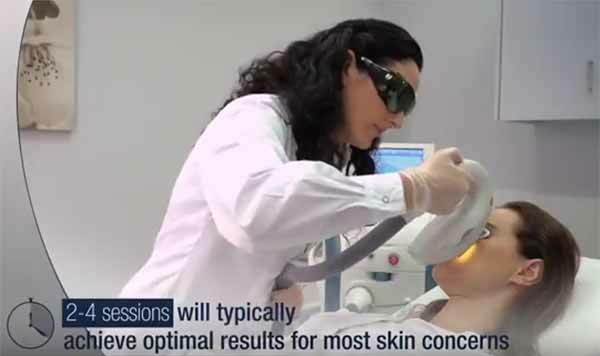 Learn more about Dermalactives skin care at Coastal Skin & Eye Institute in San Diego – (858) 943-2540. 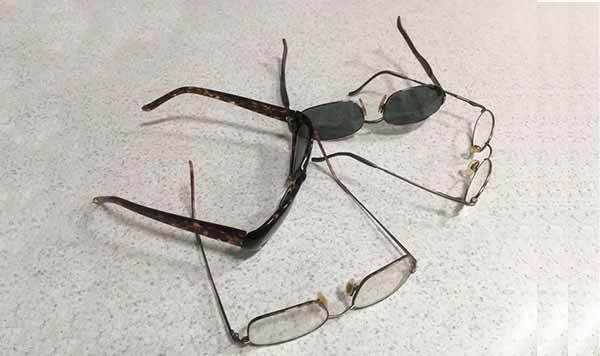 Look carefully at these glasses. Three of the pairs have nose pads and ALL of the nose pads need to be replaced. We do minor repairs and adjustments to your glasses at no charge. I will also clean your glasses for you. 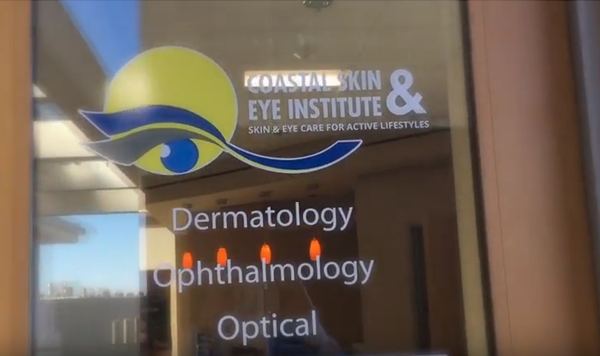 Come visit our optical department at the Coastal Skin & Eye Institute. We are at 5550 Carmel Mountain Road, Suite 206, San Diego, CA 92130, or call us at (858) 943-2540. 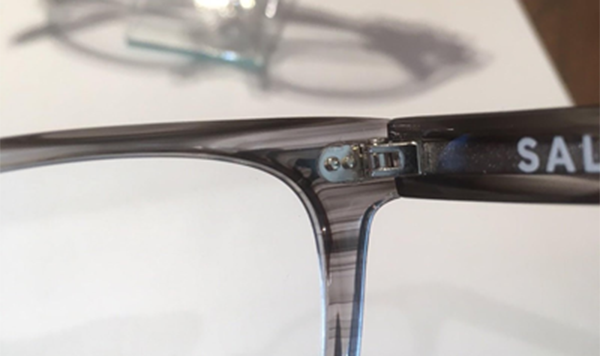 If you want to determine the quality of a pair of #eyeglasses, look at the hinges. 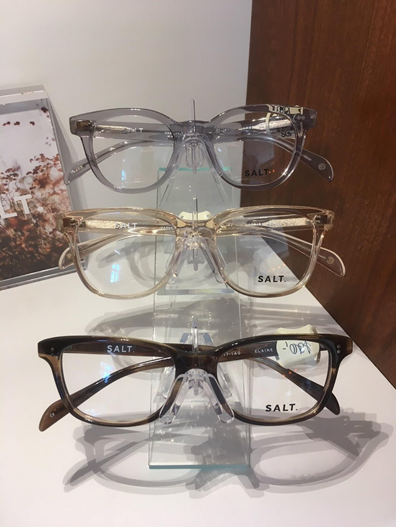 At the Coastal Skin & Eye Institute we have a wide selection of SALT. spectacle frames, and they have some of the best frame hinges made today. We have a wide selection, with one just perfect for you. Visit us at 5550 Carmel Mountain Rd., Suite 206, San Diego, CA 92130 or give us a phone call at and make an appointment with the #optical manager. Ask for #Salt.wear, but hold the pepper. Would you like to look better for your Valentine? Try some body sculpting and achieve quick results. 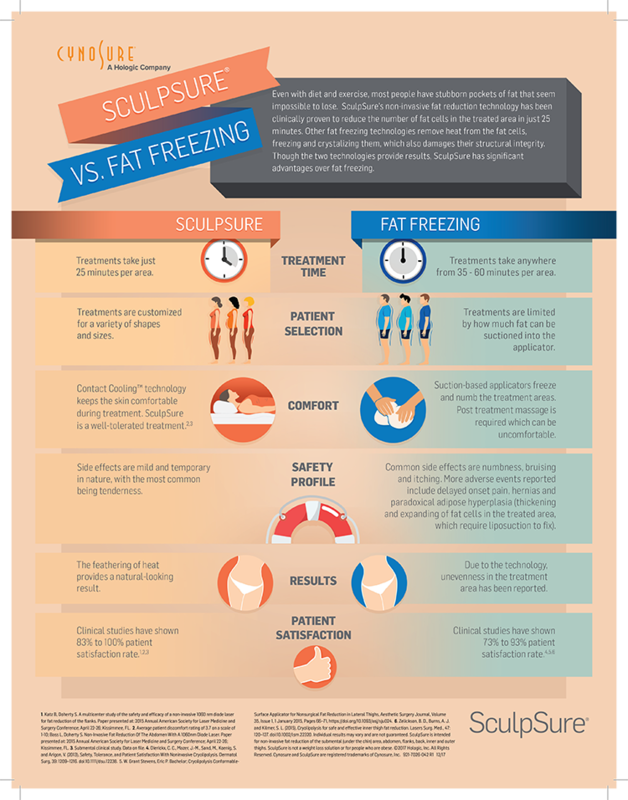 The #SculpSure procedure offered at the Coastal Skin & Eye Institute can provide you with results around your abdomen and love handles, your back and inner and outer thighs, and under your chin. 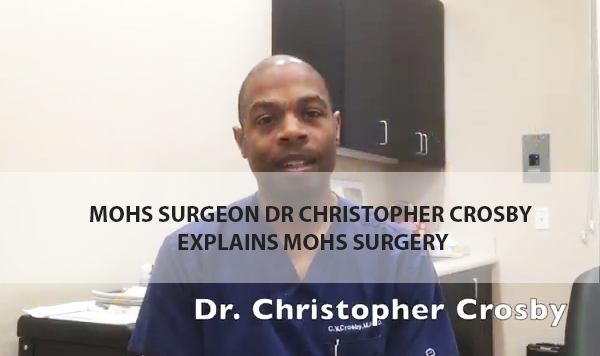 No surgery, no downtime, just results. 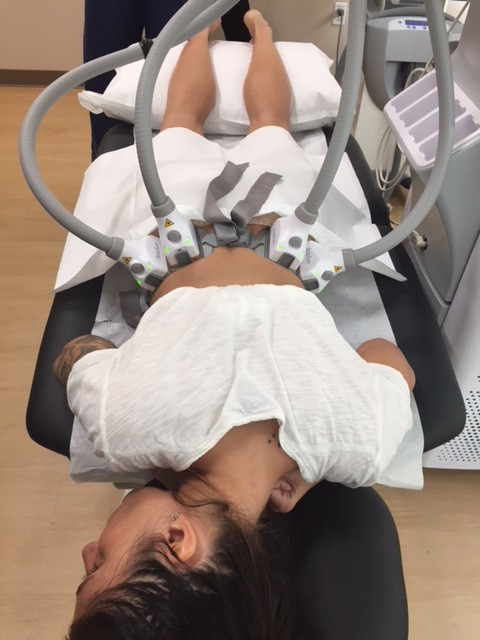 This is a picture of one of our patients receiving the procedure. Call today to make an appointment. 858-943-2540. We are located in the Carmel Valley area of San Diego in a shopping center called The Merge at Corum Court.